Just before intermission in Saturday's performance of "Sneaker Suites" by Antics, deft b-girl Cyrian Reed appeared on stage solo wearing a pair of red, LED light-up sneakers. As Reed energetically freestyled, the bulbs at the sneakers' bottom edge danced with changing colors, making it seem as if the energy of her sneakers meeting the floor generated the juice that powered her dancing body from the ground up. 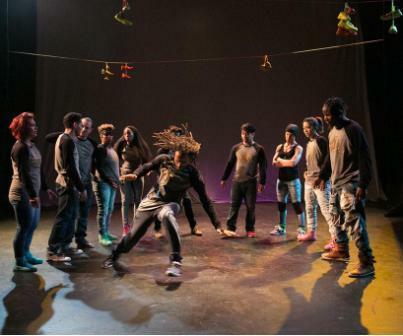 This vignette, called "Lady in the Red Shoes," encapsulated the core message of this hip-hop theater troupe's ode to all things sneaker within b-boy/b-girl culture. Using a pastiche of solos and group numbers, film, text, and spoken-word poetry, the clever and well-executed "Sneaker Suites" (directed by Antics' artistic director Amy "Catfox" Campion) called attention to the myriad ways in which sneakers are in fact their own energetic force within hip hop. The show demonstrated that beyond their mere functionality as footwear, sneakers can signify style and self-esteem, resistance to poverty and oppression based on race and gender, and cultural appropriation from the streets to the masses—much like hip hop itself. Born in urban African-American and Hispanic communities, b-boying/b-girling is a form of self-expression that at its beginnings required nothing but the body, the street, and an attitude: no expensive equipment or studio training were necessary. So it makes sense that sneakers—the only essential "gear"—became a focal point of fetishism within the culture. Throughout the show, the dancers' sneaker choices (high tops and low tops in multicolored canvas, Velcro, vinyl, or leather) were as eye-catching and varied as their abilities (popping, locking, krumping, waacking, and capoeira). The opening vignette, "Sneakers on a Wire," explored sneakers as an emblem of aspiration. With finesse, dancers tossed pairs of sneakers tied at the laces onto wires that represented power lines. It was a commentary on how, for those born into the inner city, the avenues of escape can be few. Dancer John "Magick" Liggins, who served as the show's engaging griot (speaking the words of the show's story architect and poet, Mark Gonzales), explained that shoe tossing is a way to reach toward something higher: "I can't get out of here so I throw my sneakers on wires/so my shoes have a bird's eye view of where I'd like to go." 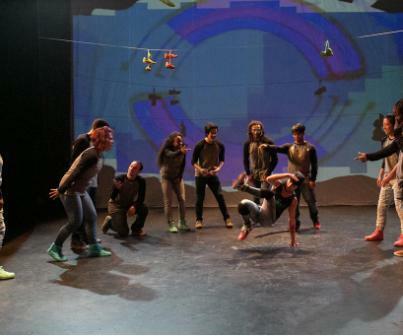 The thrilling group choreography that followed suggested solidarity in the streets, a sense that the b-boy/b-girl community itself lifts its members toward loftier horizons even as they contort their bodies upside down. As b-boying/b-girling developed as an art form, dancing feet and the sneakers they're encased in became actual ways to transcend the lack of opportunity in the 'hood. Spliced throughout the dance numbers were scenes from the film Fresh Out the Box (shot and edited by visual artist Paul Antico), which featured veteran b-boys Gabriel "Kwikstep" Dionisio, Kenneth "Ken Swift" Gabbert, and Steve "Zulu Gremlin" Roybal speaking about the centrality of stylish sneakers in standing out as dancers. The right sneakers—whether Converse low-tops, Adidas Shell Toes, Nike Cortez, or other iconic brands—and the right moves helped them forge legendary dance careers. But the show also considered the darker side of a sneaker business that, instead of pulling people out of poverty, contributes to oppression. In the vignette "Soles of Souls: Who makes your shoes? ", the dancers explored the way in which centuries-old traditions of shoe craftsmanship have been wiped out by factory labor, which swaps cheap rubber and glue for time-honored leather and thread. The dancers used their bodies to mimic the mechanization of the assembly line, passing shoes among them with arms locked in stiff, machine-like poses. Then, bursting into power moves, they suggested that the individuality of breaking is literally a way to "break" from the chains of mass-produced sameness. The vignette "Sneaker Head" carried the theme of sneakers as commodities even further, with the dancers striking Egyptian-like poses while wearing gold sneakers on their hands in front of projected text that reported surprising sneaker facts. Michael Jordan apparently makes more money annually from the sales of Air Jordan sneakers than all of the Nike factory workers in Malaysia combined (! ); $6 billion per year is spent on sneakers, which have gone from the street to the fashion runway thanks to high-end brands like Versace—appropriation that does little to benefit the communities that popularized the style. In "Beauty and the B-Girl," the troupe's female performers gathered for a fascinating exploration of gender issues within hip-hop and sneaker culture. 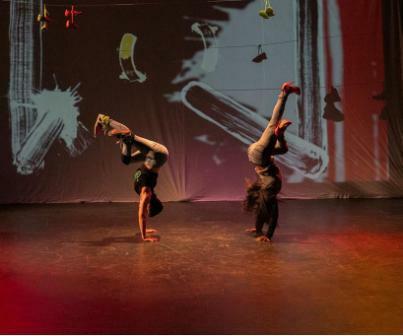 During a captivating duet, dancers Amy Campion and Ebonee Arielle Le'Triece faced off as a b-girl in sneaks and a "club girl" in high heels, respectively. (How she was able to b-girl in heels without breaking an ankle, I'm not sure! Much respect.) Wearing sneakers in the club setting—as opposed to heels, which can signal conventional femininity and a capitulation to the male gaze—was imagined here as a form of gender resistance. Sneakers are a gender-neutral, equalizing force that allows b-girls to walk the walk of their male counterparts. During a week when the shooting deaths of Alton Sterling and Philando Castile made headlines, the vignette "Plastic Bags, Body Bags, and Sneaker Boxes" had a painful resonance. Here, the show reflected on sneakers as very much "of the street," a space that is fraught with uncertainty for people of color, as the Black Lives Matter movement has highlighted recently. After traversing this dark and complex social territory, the show ended with an exuberant display of pure joy in "Sneaker Magick," in which the troupe gathered in a cypher to show off their freshest moves. Windmills, acrobatic back-flips, and uprock that oozed attitude were some of the dazzling dance feats on display among this talented group of performers. In the final moment, each dancer stuck a pose that referenced the floor, a reminder that sneakers—and b-boying/b-girling—are vital ways to both embrace and defy the gravity that pulls each citizen of Earth toward common ground. 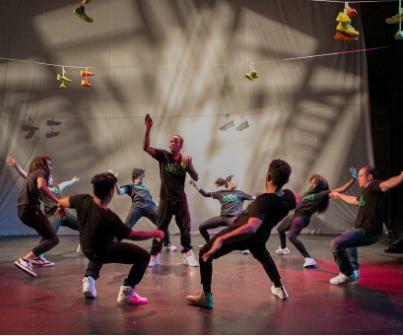 Antics dancer Bliss in the center along with dancers John “Magick” Liggins, Liezel de Guzman, Emeroy Bernardo, Michael “Menace” Rebong, Valerie Hwang, Stephen Velazquez, Ebonee Arielle Le’Triece, and Donnie “Crumbs” Counts performing “Soles of Souls” in Sneaker Suites. Antics dancer John “Magick” Liggins in the center along with Liezel de Guzman, Stephen Velazquez, Donnie “Crumbs” Counts, Cyrian Reed, Ebonee Arielle Le’Triece, Michael “Menace” Rebong, Emeroy Bernardo, Amy “Catfox” Campion, Valerie Hwang, and Bliss performing "Beauty and the B-Girl” in Sneaker Suites. Antics dancers Amy “Catfox” Campion and Ebonee Arielle Le’Triece perform a duet in "Beauty and the B-Girl” in Sneaker Suites. Antics artistic director Amy “Catfox” Campion in the center along with Cyrian Reed, Liezel de Guzman, Stephen Velazquez, Donnie “Crumbs” Counts, Ebonee Arielle Le’Triece, Michael “Menace” Rebong, John "Magick" Liggins, Emeroy Bernardo, Valerie Hwang, and Bliss performing “Beauty and the B-Girl” in Sneaker Suites.